Do I need to pay extra for additional moderators/admins? How can I add new moderators/admins? Then simply put an email address into the text field and choose the role. Please be aware that Admins & Moderators is a feature we only offer for Pro and Premium users! Do additional moderators for a paid wall need a paid subscription themselves? 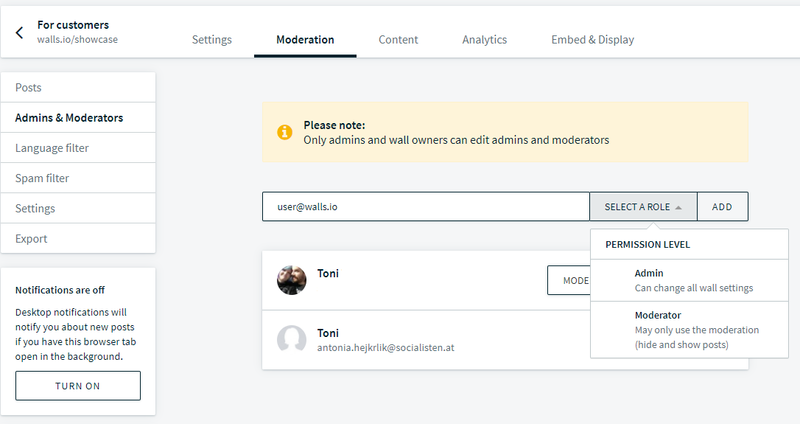 No, with a Pro/Premium plan you can invite “free” accounts as additional moderators to your wall. If the invited user registers a new account, it will be in a free 7 day trial and then switch to a free account. A moderator did not receive the invitation mail! Check in your spam folder. Also ask your IT department, if maybe a firewall or spam filter blocks incoming emails. If you still can't find our invitation mail, please contact Walls.io support!